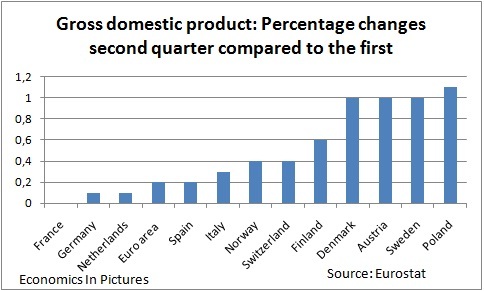 This graph shows the economic growth of European Countries in the second quarter of 2011. In France the economy didn't grow or contract compared to the first quarter. Poland had a high growth percentage of 1 percent. Average Euro Area economic growth was 0,2 percent. The growth figures for the PIIGS countries are not available yet.